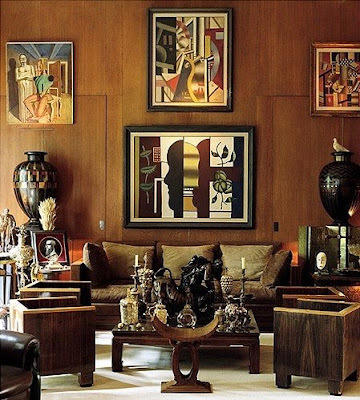 Europeans and Americans collecting African sculpture and other art forms is nothing new -- Picasso and Matisse are widely believed to be among the first to acquire African pieces, at least for their artistic worth. Lately though, I feel like I'm spotting more and more African masks, textiles, and stools at shops where I wouldn't necessarily expect to find them. 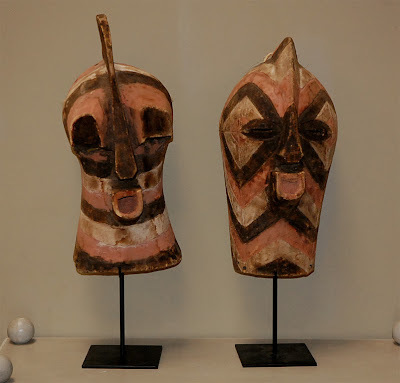 For example, the masks above are from Hollyhock and are described as hand-carved and painted 20th-century Kifwebe Masks from the Southeastern Democratic Republic of Congo. 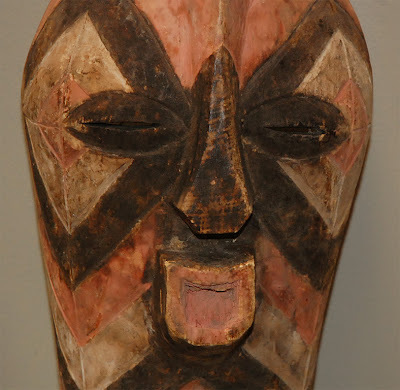 And Ceylon et Cie has a vintage Bene-Lulua mask from the border of Zaire and Angola. In terms of cloth, these textiles keep popping up in Michael Smith's projects. In 2006, the Iziko South African National Gallery was the site of an exhibition that explored the influence of African Art on Picasso's work. 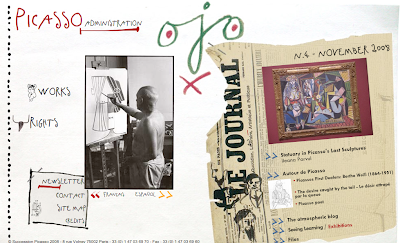 The Met also offers detailed information about African inspiration in avant-garde modern art. It's thought that in 1906 Matisse bought a small African figure from the Democratic Republic of Congo -- a work that greatly impacted him -- but the artist also collected Kuba cloth. 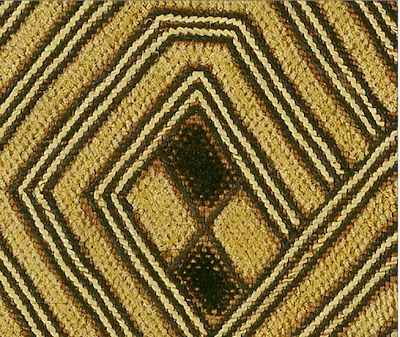 Shown at the top is a 19th-20th-century example woven from raffia palm fiber (collection of The Met). The second example above is from Jayson Home. 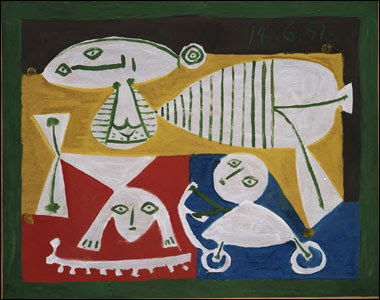 Image five, courtesy the BBC, is Picasso's Mother and Children Playing, 1951. The image below is small, but I wanted to add it to the mix because of the petite "Kenya box" and the feathers. 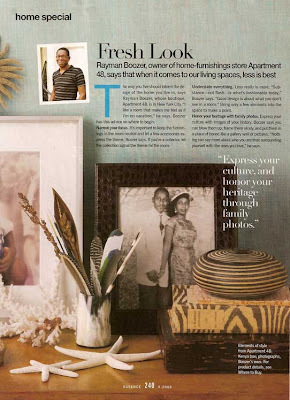 Rayman Boozer design in a tablescape for Essence, September 2006. 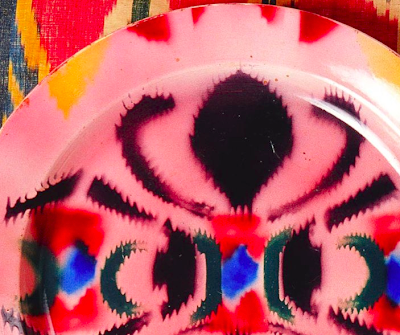 A friendly reader sent me the image below, snapped at Kaba Africa Art at the Chelsea Flea Market in New York. (Outdoor Lot, 25th St. between Broadway & 6th Avenue, 917-696-3699.) 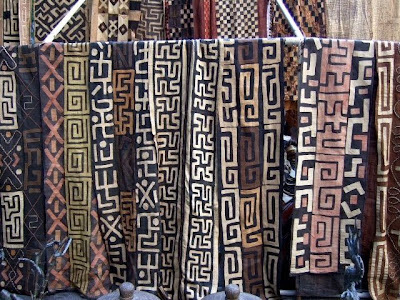 I'm told the textiles represent Congo design, and as always I'm struck by the inspiration David Hicks derived from similar cloths. 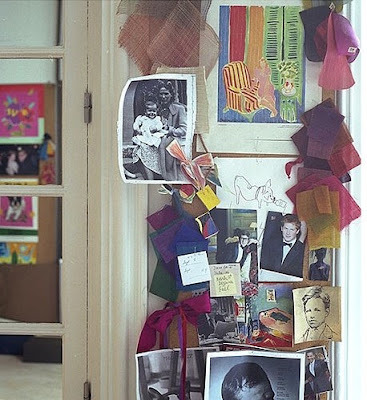 Below are samples from Hicks' scrapbooks as seen in David Hicks: Designer. In Atlanta, the Carlos Museum has a strong collection of African art. 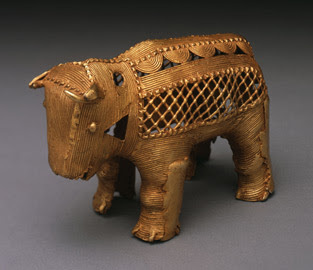 Below is a copper and gold figure of a bull, from the Cote d’Ivoire, Lagoons Region, early 20th century. 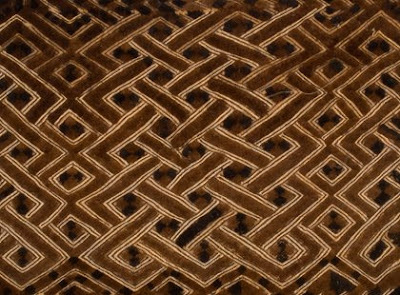 Update, 2.04.09: Visit Esther Fitzgerald for a large selection of African textiles. Right now, in response to stress, some of my friends are saying they want to stay home under the covers. But personally I'd like to escape to a darkened art history seminar room and indulge in a few fascinating courses. I'm envious of current Agnes Scott students because there are some intriguing ones now offered by the art department: Women As Artists and Patrons from the 12th to the 17th Centuries, and Face Off: The Art of Self-Portraiture, just to name two. What I can do is post more arts-related content. 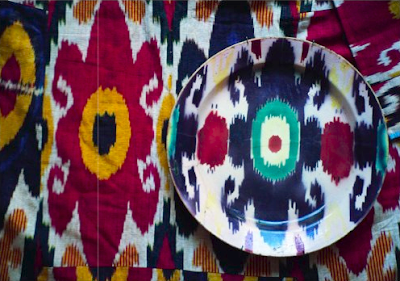 The ikat-patterned plates shown here instantly caught my eye as I flipped through Selvedge, issue 14. To be honest, I assumed patterned plates like this were a relatively new thing. 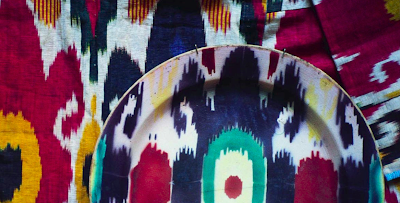 Actually, according to Victoria Rivers, many fabric-like patterned plates were produced in Russia between 1892 to 1917, with the oldest ikat plates coming from the Gardner porcelain factory. The older plates were decorated in faience style, meaning that an opaque white slip was used beneath colorful over-glazes. Later plates were sprayed with color. 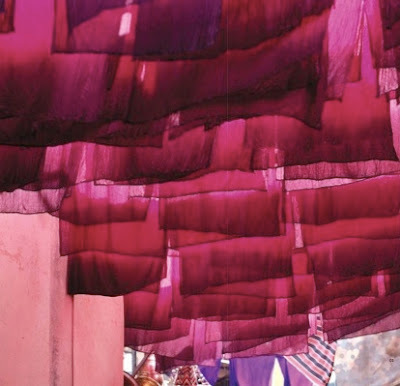 Hues favored include the same deep reds, pinks, blues, greens and violets seen in Bukhara-produced Central Asian textiles. Common motifs encompass double rams' horns, concentric or rhomboidal-shaped eye spots, and varied parallel stripes. (To learn more, order a copy of issue 14 from Selvedge.) 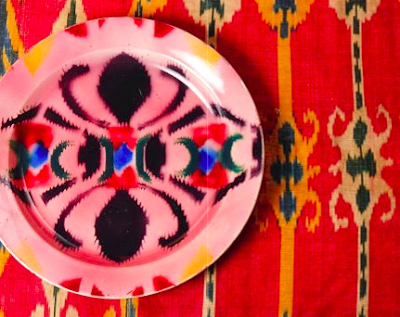 Since ikat became such a big trend during the past two years, and new products have been covered thoroughly in magazines, I'm not repeating those items today, but I did find a circa 1920 Russian/Soviet plate for sale here. If you are searching for similar contemporary tableware, try the Oscar de la Renta for Lunt line. 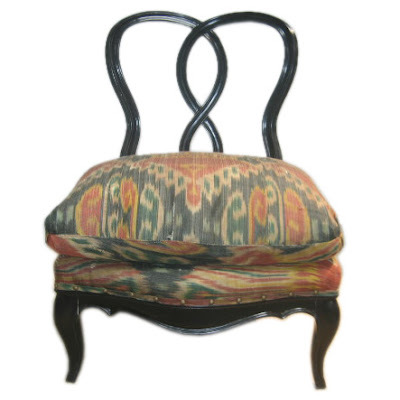 I thought this chair, currently for sale at Ceylon et Cie, might inspire a DIY project. 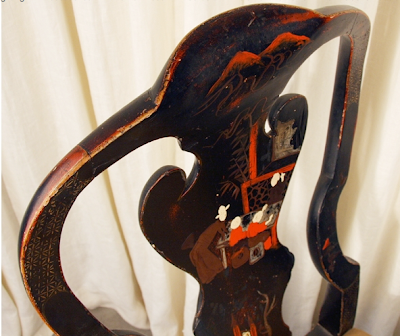 Perhaps some black paint on a flea market chair and a new seat cover made using a found remnant. Click here for one of several related past posts with some fun flashbacks from the last ten years or so. 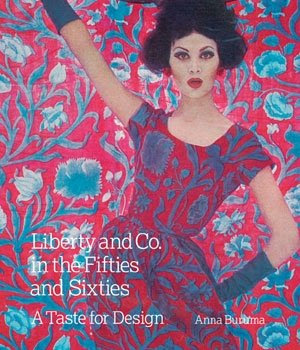 Oh and FYI, on the subject of textiles and education, Antique Collectors Club is currently offering 20 percent off all titles such as Liberty and Co. in the Fifties and Sixties, a book Style Beat wrote about a few days ago. Nothing educational this time. Just wanted to end a rough week with something to stir the senses. 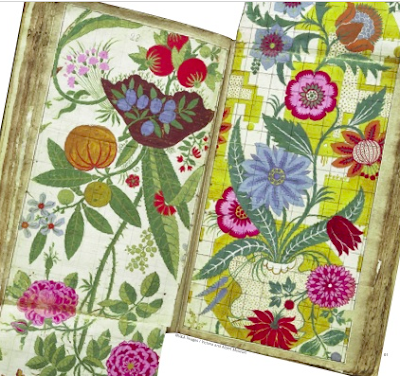 All images are from Selvedge, issue 17. 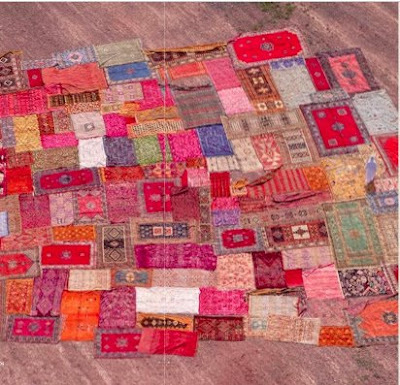 Above, carpets drying in the sun near Marrakech. 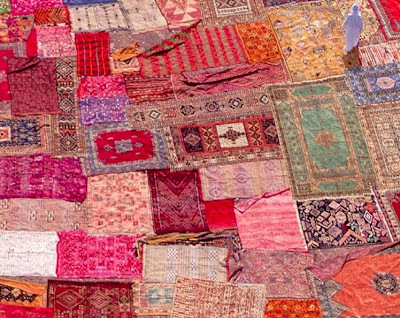 Below, the dyers' souk. 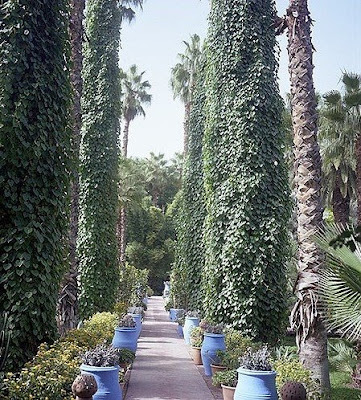 Related past post: Churchill's Marrakech. Above, vibrant Selvedge images of the Leman Album. Issue 19 features a story about Spitalfields' silks. 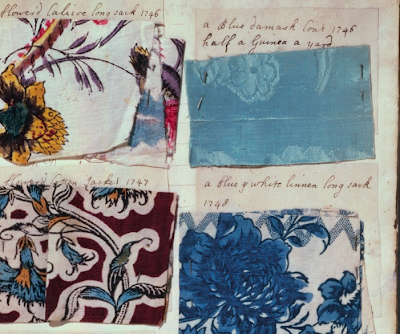 Below, English 18th-century textile samples from Selvedge, issue 16, part of a fascinating story about archives. And, below, finding beauty in everyday objects. 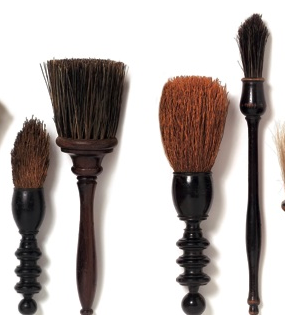 Whimsical French and English clothes brushes from the 1950s and 1960s, and 19th-century writing-desk brushes that removed powder used to absorb excess ink. Again from Selvedge, issue 16. Oh, if not for the recession. 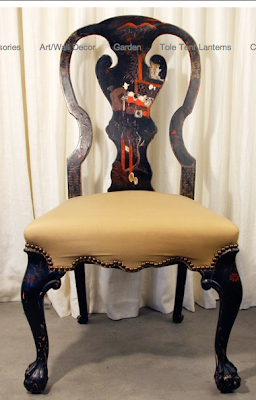 This beautiful chinoiserie chair kills me. 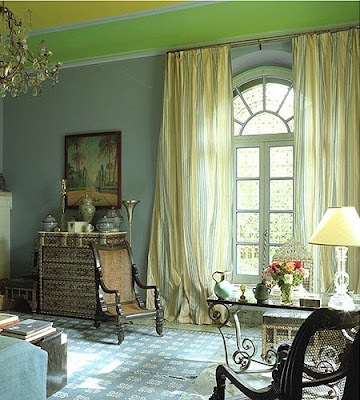 It's an antique, from the 19th century, but everything about its style is inspired by the 18th century. Confused? Much like the way clothing today can be heavily inspired by decades past, Victorian (19th century) furniture was all about revivals -- Gothic Revival, Egyptian Revival, baroque-inspired and so on. 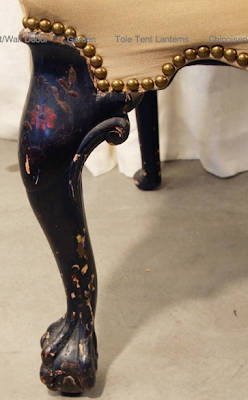 This chair is clearly influenced by 18th-century English furniture, with its high back and open splats, and the cabriole legs with ball-and-claw feet. As the V & A explains, British chairs with curving back splats and cabriole legs are frequently dubbed 'Queen Anne.' Interestingly though, these chairs first came into fashion not during the reign of Queen Anne (1702-1714), but in the reign of George I (1714-1727). 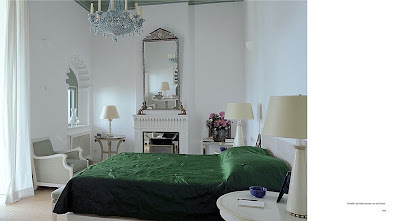 The truly sumptuous part is the painted finish inspired by Asian lacquer. Typically when done in the West this was called "japanning." Black backgrounds with red and/or gold detailing are classic. 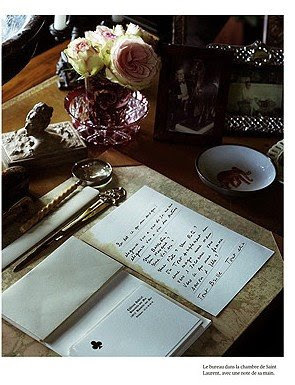 So basically the chair is a bona fide antique based upon furniture from an even earlier era. Moreover, it's super-chic. Available at Coleen & Co. If Super Bowl Sunday isn't something you look forward to all year, the High is offering discounted general admission on February 1. Adult tickets will be marked down to $10 and are now available online. For anyone who plans to be in Atlanta this weekend, there's plenty of wonderful art to savor. I also feel compelled to follow up and mention that the High has a good selection of children's art books, including titles about artist Romare Bearden. 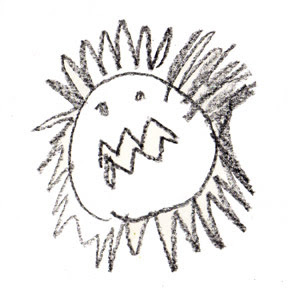 Another fun activity might be to sift through all your child's art work and select one for framing. Since many parents continually accumulate what my friend, Ellen Luckett Baker, calls a critical mass of kids' drawings, it's tempting not to commit to a permanent frame. But every few years, when budget allows, framing one work in a refined "grown-up" gallery-worthy frame is a lovely thing to do. My grandparents did this for us. Besides validating the child's feelings, sometimes you end up with an interesting addition to your collection. 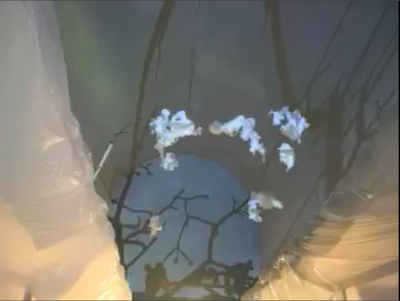 Sheets to the Wind was an installation created by Agnes Scott professor, Nell Ruby. 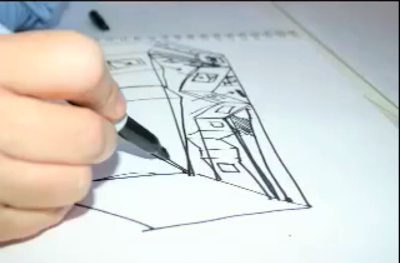 Some of the themes she explores include the power of humans to create beauty and the potential of imagination. Click here to access the video via iTunes U, or visit the iTunes store. As always, the podcast download is free. It's sort of a tradition in my family -- on my dad's side -- to go against the grain. "Just because other Americans have HBO or frequently eat at hip restaurants, doesn't mean we have to." This philosophy is decidedly uncool when you're thirteen but no so bad when you're an adult. Being frugal in certain areas sometimes makes it possible to enjoy other luxuries, and it definitely comes in handy when the rainy days hit (or the stormy years). 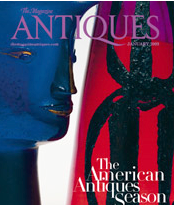 LouLou's eclectic vignette is all about personal objects. 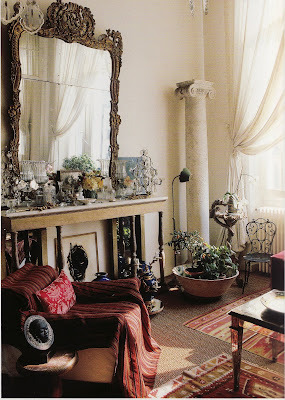 More and more when I look at other people's interiors, I find myself focusing on their art and accessories. 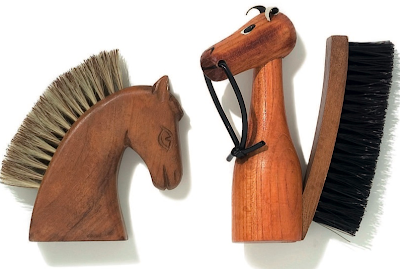 It's been said a million times but those are the interesting things, whether the art is hanging in a stately Neff-inspired house or a tiny bungalow. 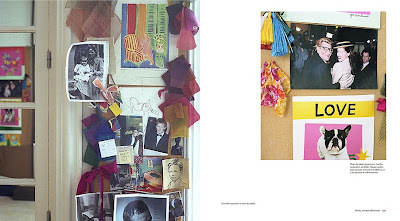 So while I love the fantasy of Yves Saint Laurent's and Pierre Bergé's exotic and far-flung homes captured by Ivan Terestchenko in his new book, Les Paradis Secrets d' Yves Saint Laurent et de Pierre Bergé, I'm most intrigued by the arrangements of art, personal collections, and inspiration boards. Ivan says that famed brit designer, Peter Saville, is responsible for the French cover. Other editions will be published in the UK at Thames and Hudson, and in the US at Vendome, but with different covers. Pierre Bergé wrote the introduction. 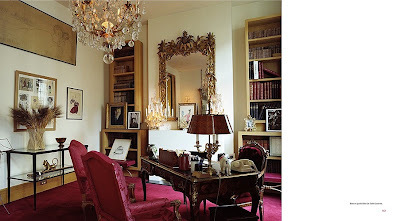 For the scoop on the related YSL Christie's auction, be sure to read Emily's wonderful post. 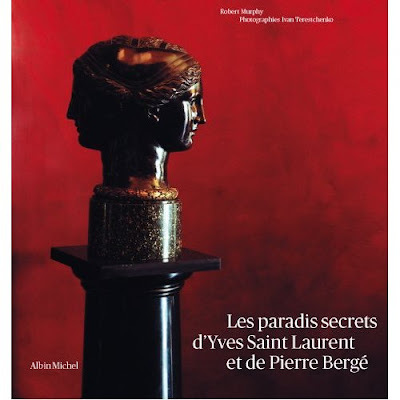 Yesterday, around my house, the memory of Yves Saint Laurent kept making an appearance. 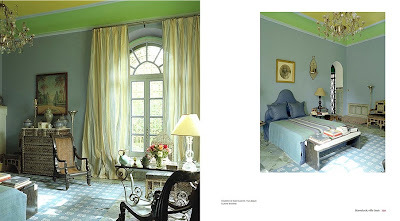 The framer called to tell me that my Victoria Molinelli watercolor of YSL muse LouLou de la Falaise's apartment was ready to be picked up, and acclaimed photographer Ivan Terestchenko let me know that his new book, Les Paradis Secrets d' Yves Saint Laurent et de Pierre Bergé, was just back from the printer. 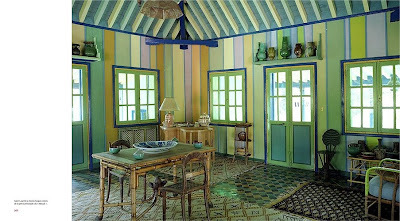 The lavish volume highlights all of Saint Laurent's homes in France and in Morocco, showing not just the art collections but also personal souvenirs that have never been seen before. Soon I'll be back with a complete post. For everyone who toils away each day trying to inspire and enlighten, whether in the workforce or in the home as a mom, it's nice to know when you've made a tiny impact. Even a minuscule impression. I'm thinking of my close friend who spent a year in Paris studying Toulouse-Lautrec. These days she's far removed from the art world, basically immersed in babies' diapers not lithographs. (Her happy choice, of course.) 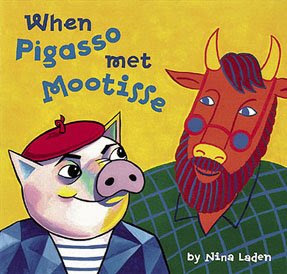 The closest she comes now to French masterworks are the copies in a book she reads nightly to her two-year-old. The color theory book was actually a baby gift from me. I was a little on the fence about giving an inexpensive artsy edition, rather than a swankier present, to a dear friend and indirectly I blogged about it last year. I never dreamed it would be such a hit. "I know what Stewart should do Mommy. He should just mix the red icing with the blue icing, and then he would have some purple icing and could paint himself purple." So some days all the effort to be creative is well worth it. 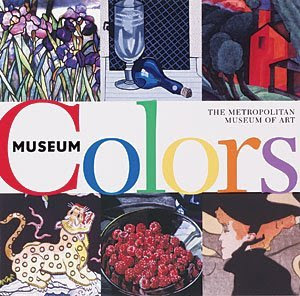 Learn about global color here. Credits: the new children's books shown here can be found at the National Gallery shop and at The Met. 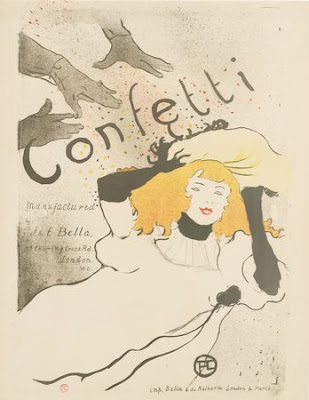 The third image, courtesy MOMA, is Henri de Toulouse-Lautrec's Confetti, 1894. Lithographed poster. 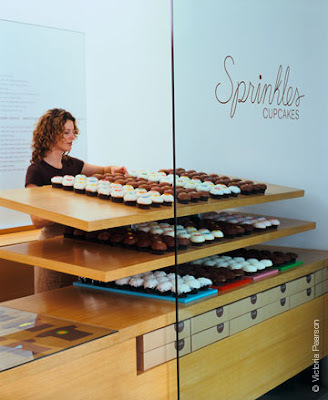 And the last is Victoria Pearson's photograph of Sprinkles.